When combined with Maggi Onion Soup, Nestle Extra Thick Cream becomes the world famous 'Onion Soup Dip'. Note: Due to import restrictions we are unable to get NZ Reduced Cream. 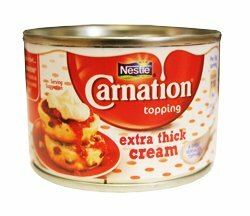 According to our customers, Nestle Extra Thick Cream from the UK has an identical taste. I was skeptical at first...but add Maggi onion soup to this and it tastes 100% like how we make it at home. Sooo good, sooo happy. Thanks Sanza!! It tasted just like back in NZ, but the size of the can is strange!! It's usually a 290g can and you add a packet of the Maggi soup to make the dip, so if you add a full packet of soup to this, it will be too strong. And then if you have 2 cans of the reduced cream you need about packs of soup so there is always wastage. I could not tell the difference between this product and the Nestle Reduced Cream! and its for a fraction of the cost of getting Reduced Cream in England! Fantastic! Super Product! Tastes just the the nestle reduced cream that you get in New Zealand.